Deep Lines... 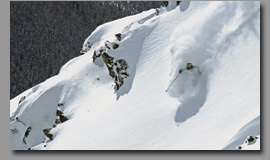 Trips & Packages - Backcountry skiing in the Kootenays. The legendary Rogers Pass. Easily accessible from the east or west and a great place to spend a day or a week. Endless opportunities for long descents and mountaineering objectives. Reliable snow quality and amazing scenery put this place at the top of the priority list for any backcountry skier. 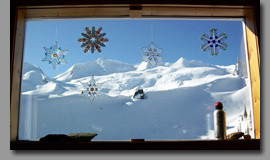 Many options exist for day tours and there are several huts that provide overnight accommodation in the backcountry. Prices start at $125 per person per day based on a group of four. This cozy lodge, perched in the Selkirk Mountains north of Rogers Pass is perfectly situated for top notch ski touring and mountaineering. 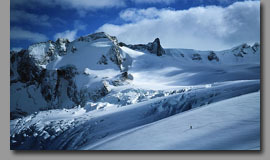 Long glacier runs and mountaineering objectives are the name of the game here. 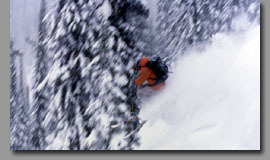 For the bad weather days there are excellent tree skiing opportunities close to the lodge. Access by helicopter. Prices start at $2150 for a 7 day package. Located in the Monashee Mountains south west of Revelstoke this place sees more snow than most people know what to do with. A sidewalk shoveller's nightmare and a skier's dream. A wide variety of terrain including some of the best steep natural glades you can imagine and a deluxe lodge define the Deep Lines philosophy. Access by helicopter. Prices start at $1125 for a 3 day package. The Fairy Meadows, located in the famous Adamant range this destination tops the list for backcountry skiers around the globe. 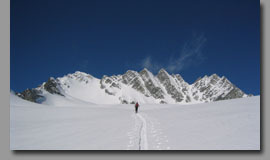 Spectacular terrain including rugged peaks and long glacier descents are what give this spot the reputation of a ski mountaineering mecca. Accommodation is the Fairy Meadow (Bill Putnam) hut. Access by helicopter. Packages start at $2400. Dates for all trips are flexible so we can adjust to fit your schedule. Click here for booking information. All trips will be custom tailored to suit your interests and ability.